STURGIS, SD – Award winning KBHB Radio program, news and sports director Gary Matthews has been selected to receive the Tom Brokaw Award that recognizes excellence in broadcasting. Presented in a cooperative effort between the South Dakota Broadcasters Association (SDBA) and the Contemporary Media & Journalism Department of the University of South Dakota, it is one of USD’s highest honors. Matthews is originally from Saratoga, WY and a graduate of Black Hills State University with a Bachelor of Science Degree in Mass Communications. His career choice led him first to KSKY 95.1, Deadwood & Rapid City, SD and then onto KDDX 101.1 in Spearfish, SD. In 1995, he joined KBHB Radio 810AM, a highly recognized Heritage Station with listeners in five states. Matthew’s role goes well beyond that of news and sports director at the 25,000 watt station. Along with managing sports and news coverage on a regional basis, he is instrumental in the continued advancement of new broadcasting technologies utilized by the station, including digital video and broadcasting streamed on line. The Tom Brokaw Award in broadcasting focuses on the areas of electronic journalism (on or off-air involvements) and public affairs. In these areas, Matthew’s excels with his involvement in and reporting of local, state and regional events. 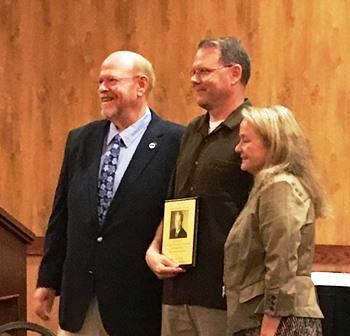 As a respected member of a news-sharing group among radio stations across the state, his “concise, consistent, and capable reporting is admired among his peers,” says J.P. Skelly, News Director with KORN News Radio, Mitchell, SD, who nominated Matthews for the prestigious award. He has been recognized by the SDBA and the Associated Press in broadcasting and commercial recording. He was also instrumental in The Greater Sturgis Area Character Speaks Campaign. Another KBHB ‘Big 81’ alumnus will also be recognized with the Tom Brokaw Award. Jim Thompson will receive the coveted award alongside Matthews. Thompson’s half century of service in broadcasting is marked by on air work, management, and serving radio stations as a syndicated programmer. He has served as president of the SDBA. He was selected as Sportscaster of the Year by the National Sports Casting and Sports Writing Hall of Fame, was inducted into the South Dakota Sports Hall of Fame, the Casey Tibbs Hall of Fame, and the Black Hills Stock Show Hall of Fame. As a professional rodeo announcer, Thompson has been at the helm of the National Circuit Finals, the Indian National Finals Rodeo, Collegiate National Finals Rodeo, and the National High School Rodeo Finals. A United States Army veteran of the Korean War, Thompson’s political career brought him to the state capitol as a state senator for District 5 in Watertown, SD, where he won two consecutive elections as a lawmaker. Both broadcasting professionals received the Tom Brokaw Award during the SDBA Annual Leadership Conference held September 15, 2018, in Deadwood, SD.